The fight against climate change has two main parts: ‘mitigation’ (trying to cut the greenhouse gases we produce) and ‘adaptation’ (doing something about the effects of climate change that are already happening). We need both parts, but the public usually talks about mitigation. People say that climate change will happen in the future and we must do something now for our children and grandchildren. People think that future problems are bigger than the problems we have now. But already, today, climate change is the cause of 87 per cent of disasters in the world: droughts, terrible storms, floods, fires, and landslides. And these disasters affect some of the poorest people in the world. There are sudden disasters and slow change too. The sea level is rising. This makes the water near the sea more salty, so the land becomes infertile. Rainfall is changing. 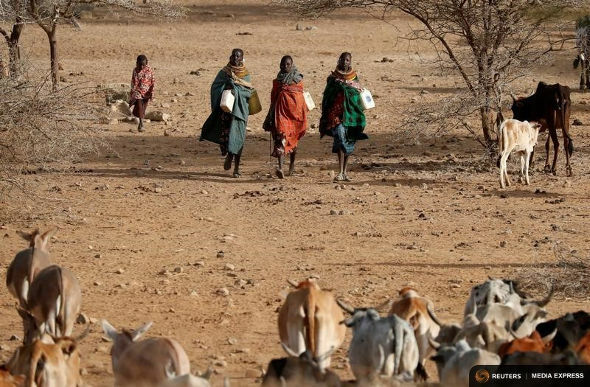 Every second, one person has to leave their home because of extreme climate. But no one helps people to adapt to these changes. We have to protect the poorest people: make the sides of rivers stronger to stop floods, try to stop diseases, build roads and buildings that water cannot destroy, help with insurance, storing water, disaster warning systems etc. Farmers are already changing. In places where they get floods, eg. Delaware, they are changing some areas to prepare for the future. In very hot regions eg. the Indian city of Ahmedabad (where 1,300 people died in a 2010 extreme heat wave), they are using heat action plans: training health workers, giving out cooling supplies, opening public areas for shade, and educating people. In some areas, people simply have to leave, for example whole villages in Fiji, the Maldives and China. But adaptation is not just a technical exercise; we also need to decide what kind of world we want. Which people are important to protect? If we build walls to protect us from the sea, will we also build walls to keep out people? So this is a crisis of social justice. Disasters show how unequal societies are. It is a lot more likely that women die in natural disasters than men and that women, ethnic minorities and the disabled suffer more from environmental problems. And the adaptation is very expensive. The cost of adapting to climate change in ‘developing’ countries could be $300 billion a year by 2030 and $500 billion by 2050. Rich countries are not giving much money to help poorer countries. There is one good thing: the solution to many problems is the same. The struggle for climate adaptation is the same as the struggle for migrant rights, for decent work, for better infrastructure, for democracy, against gender violence. It is the struggle for a safer world. NOW READ THE ORIGINAL AND A LOT MORE DETAILS: https://newint.org/features/web-exclusive/2017/02/22/brace-for-impact-time-to-build-fight-for-climate-adaptation/ (This article has been simplified so the words, text structure and quotes may have changed). This page was last edited on 1 March 2017, at 22:45.